Your day at Bedrock Golf Club wouldn't be complete without some well-spent time preparing for your round.. We offer an exceptional putting green and a chipping area. 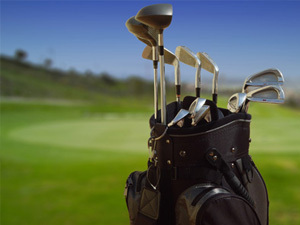 If you'd like a little help with your game, speak with our golf professionals. They are happy to schedule some time with you for a lesson and help shave some points off your score. The Delicious "Back Nine Pub"
Visit our delicious pub with a large variety of beverages and light foods. Watch the games on our big screen TV's. Relax on warm summer days on our covered decks overlooking the ninth fairway. The "grill on the deck" is open summer months and offers fabulous burgers, sausage, chicken and daily specials on Saturday and Sundays for lunch, 11:30p.m. - 3:00p.m. Daily offerings include: the Bedrock mini, hot dogs, P's famous muffins and assorted snacks.